Rubenerd: Generalising about Gen Y generalisations! Generalising about Gen Y generalisations! Since I switched to Opera 10 as my primary browser when I got fed up with Firefox's constant crashes and sluggish performance (a topic for a future post) I've started noticing ads again. Need to set up some filters now that I don't have AdBlock Plus any more! 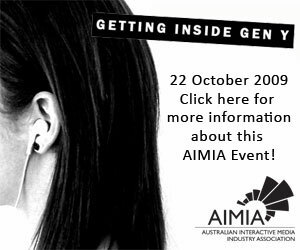 Anyway, I saw this advertisement on a news site which redirects to the gargantuanly-titled Australian Interactive Media Industry Association article that's talking 'bout my generation, titled Getting Inside Gen Y.
They’re lifestyle centered, impatient, socially aware and have an intimate relationship with technology. Many businesses are struggling to understand the trendsetting Gen Y’ers and by attending this forum you will get the answers to these questions. Look at us, we're so hip and with it we can use The Chat Speak by using Y instead of spelling out the word, which is clever because that's the generation we're talking about! We also want to encourage you to look beyond the generalisations… by making sweeping generalisations about how they're lifestyle centered[sic], impatient, socially aware and have an intimate relationship with technology! I guess I'm a fringe case, but I'm a generation Y'er and as far as I know I'm not lifestyle centred (what does that even mean?) and am certainly not socially aware, unless Twitter somehow offsets real world social awkwardness in some bizarre way. To be fair I'm probably impatient and have an intimate relationship with technology though. I get the feeling I won't be attending this conference thingy. Not that I could even if I wanted to anyway, because they're advertising for an event that has already happened! I suppose I could use a time machine.